As indoor climbing has flourished and city gyms have honed in on urban professionals as viable clientele, the sport has found itself increasingly united — both in geographic proximity and in customer base — with the local coffee shop (whether Starbucks or hipster hole-in-the-wall). It’s not surprising then to find that one of the industry developments of the past few years is for gyms to include a café space (tables, chairs, WiFi, food, drinks) within the confines of their climbing facility. And this trend is not unique to the United States; from the Castle Climbing Centre in England to Grizzly Coffee & Climbing in Japan, “coffee culture” has spread to all corners of the world, and so too has this coffee/gym combo. There are a number of benefits to having an in-house café—a refreshment space that offers customers more than just Gatorade and Clif Bars—and the one that stands out most is the friendly, social atmosphere that a coffee shop adds to the whole gym. The fact that so many people need that daily caffeine fix means that access to coffee at the gym can enhance the overall customer experience. And for gym owners, coffee is a way to diversify revenue, particularly related to what retailers refer to as the captive market—those customers who are already in a gym to climb. 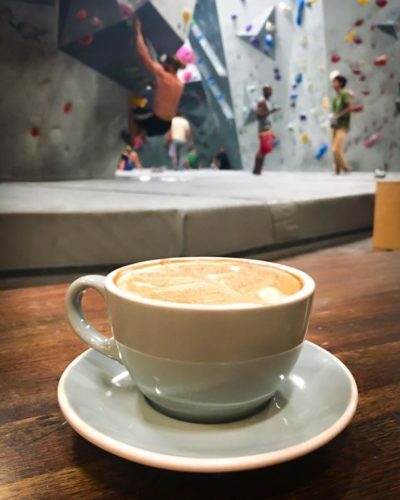 That’s why Bolder Climbing, a new bouldering gym in Calgary, Alberta has included a hip coffee shop with beans roasted in-house by the Bolder Coffee Company. 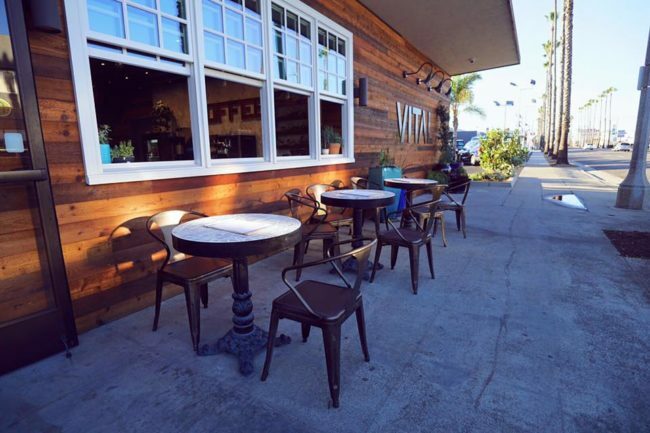 Bouldering gyms are a natural place for social spaces which is why Southern California-based Vital dedicated valuable space to a coffee and tea café in their new Oceanside bouldering facility. 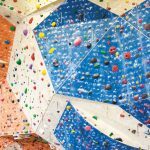 Even full-service sport climbing gyms are getting in on the action. The new Cliff Hangers in Mooresville, North Carolina put in a beautiful café and lounge complete with HDTV’s. Jason Bogroff speaks of this coffee/climber connection when discussing Rock Your World, a coffee and climbing facility in central New Jersey that is still in the planning stages. “The original business plan was based on buying land and building an optimal building to house a unique and differentiated climbing experience,” Bogroff says, noting that the coffee and climbing union seemed like a logical move because he was passionate about climbing and his wife was passionate about running a café. 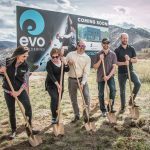 Beyond a personal interest, Bogroff is getting analytical and looking at his target market demographics—a must for any gym owner considering the addition of a coffee shop. “Our local target market is very focused on fitness and health,” he says of Flemington, New Jersey. 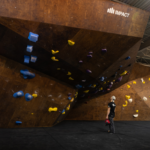 “Health food, organic farmers’ markets, and niche restaurants do well.” From that observation, Bogroff figured a climbing gym with a specialty café would be a suitable addition to the neighborhood. Although a friendly atmosphere and an enhanced customer experience are difficult to quantify, there are tangible benefits of a café as well. From a managerial perspective, an in-house coffee shop offers an area that is conducive to discussions when holding interviews with prospective employees or planning sessions with routesetters. Also, beverage coupons (“Free hot chocolate!”) create synergy by attracting climbers into the café—and those coupons also make easy prizes during gym comps and promotional giveaways. One of the most notable gyms to have a coffee shop fully incorporated to its identity is Café Kraft, founded by Hannes Huch in Nuremberg, Germany, in 2011. In name and ethos, the gym nods to the region’s coffee and climbing history. 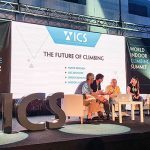 (An eatery with the same name was the meeting place for famed European climbers, including Wolfgang Güllich, in the 1980s). 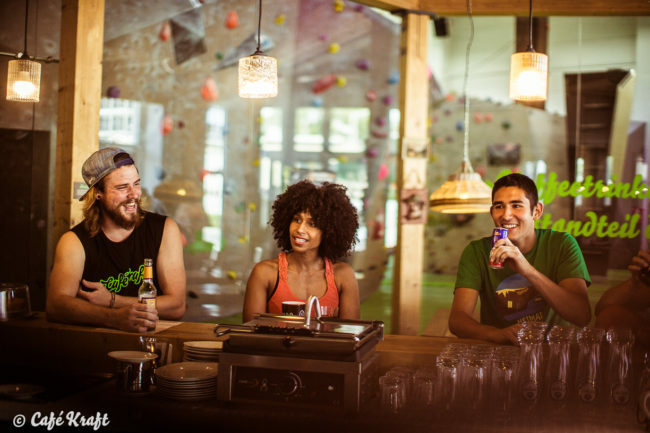 Huch, who opened a second Café Kraft in Stuttgart in 2015 and is now the franchise’s Chief Marketing Officer, says a coffee shop entices patrons to stay at the gym much longer, and he estimates that perhaps as much as 50 percent of the climbers who visit his gym also use the café for drinking, eating, or relaxing. “It’s really nice when you spend some time on making it a really cozy place,” Huch says, pointing out that it’s important for gym owners to give a café the attention it deserves. 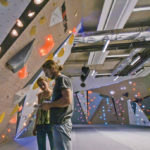 He also notes that creating a space that is closed off from the gym’s climbing section is important: “I would never do it if the café is not separated with a glass wall from the climbing walls; otherwise you have chalk on your pizza and the whole gym smells like pizza,” he advises prospective owners. Another European gym that has taken that idea of separating the coffee shop to a literal and figurative level is The Castle Café, a recently refurbished part of The Castle Climbing Centre in London, England. In addition to offering food and drinks to patrons on a mezzanine that features three tables and twenty bar-style seats, the café also has fifteen bar-style seats in its downstairs level—and fifteen employees working the café and kitchen to keep the whole operation going. On a given weekend, especially during the chilly months of January and February, the café might serve as many as 850 customers in a single weekend. But aside from the in-house action, The Castle Café also maintains its own blog, actively supports local farming, and even caters events—all of which are activities that detach the space somewhat from its original climbing context. 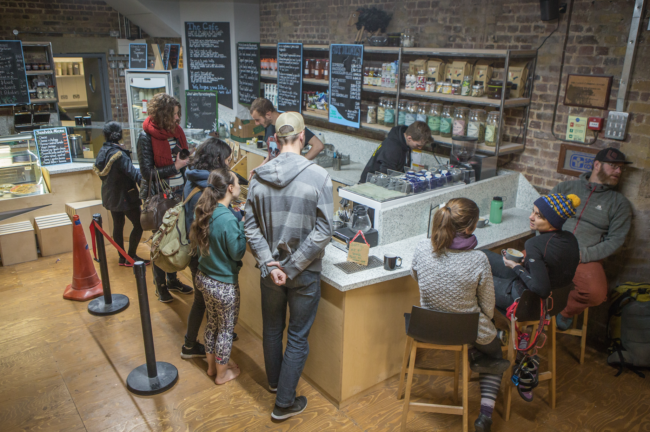 On the customer’s end, just as a convenient cup of coffee can positively supplement a gym experience, a bad transaction in the café can reflexively blemish one’s opinion of the entire climbing facility. And if a coffee shop is to offer snacks in addition to coffee, it’s imperative that the menu be updated frequently to hone in on climbers’ diverse and ever-changing eating habits. “Food is more of a problem than drinks,” says Huch, who points out the importance of dropping items from the menu that aren’t popular. “[Café Kraft] tried to offer salads, as we thought that every climber loves salad. But we hardly sold them—no salad anymore,” he says. The costs of starting a coffee shop can vary wildly, but most estimates put the absolute minimum upfront capital—which goes towards high-volume brewers, refrigeration equipment, sinks and drainage, countertops, and furniture, among other necessities—at $10,000—$15,000. As a big expense for any gym, it is important that the space be the best iteration for the money—meaning, gym owners shouldn’t be hesitant about branching out from the traditional coffee shop model if doing so would better align with their own expertise and the customer base. Having a coffee vendor sublease is an option with a lot of upsides. “The café being separate means the café owner would be responsible for the buildout, permits, inspections,” adds Bogroff. In other words, subleasing takes nearly all of the burden—both financially and operatively—off of the gym’s shoulders. Beyond that, a gym that is open to subleasing a café can attract eager upstart vendors and local coffee brands that lack the initial funding to build their own shop or rent a brick-and-mortar store. This option was exemplified by Triangle Coffee, which began in 2015 as a mobile coffee stand inside Brooklyn Boulders Somerville, and moved out after a year to open shops elsewhere. Conveniently, a cup of coffee goes well with all of the above.